Opioids are morphine-like drugs used commonly for pain relief. They are very effective for short-term moderate-to-severe pain due to surgery or injury, and can be crucial for cancer pain. However, opioids have been increasingly prescribed for other types of pain. About half of the US opioid market is chronic, non-cancer pain including back, osteoarthritis, and neuropathic pain. Opioids are highly addictive, and as many as one in four patients receiving long-term opioid therapy in a primary care setting struggles with opioid use disorder. In 2014, nearly two million Americans either abused or were dependent on prescription opioid pain relievers. The epidemic has stretched across the country and continues to grow exponentially worse. 1995: The American Pain Society pushes the concept of pain as the fifth vital sign. The medical community begins to try to eliminate pain, rather than control it. 1996: Purdue Pharma debuts OxyContin with an aggressive marketing campaign. Within five years, the number of opioid painkiller prescriptions has climbed to 44 million. 2002: Doctors in the United States are prescribing roughly 23 times more OxyContin than in 1996 and sales of the drug have increased more than thirtyfold. 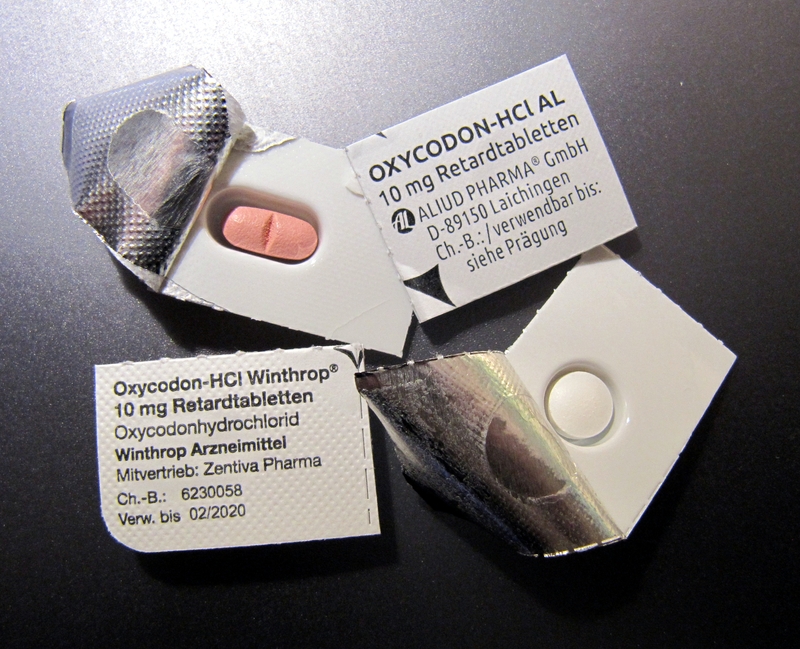 2009: The US consumes the vast majority of the world’s opioid painkillers, including 99 percent of all hydrocodone and 81 percent of oxycodone. According to the CDC, about 44 people die every day from overdose of prescription painkillers. Providers wrote nearly a quarter of a billion opioid prescriptions in 2013. However, a small minority of physicians are prescribing the majority of opioids. Only 3 percent of prescribers wrote 55 percent of opioid prescriptions. One-fifth of people who misused prescription painkillers got them from a doctor. About half of people who misused prescription painkillers got them from a friend or relative. Enough opioids were prescribed in 2016 to provide every American with 36 pills. In Alabama, Arkansas, and Tennessee, enough opioids were prescribed in 2016 alone for every resident to have about 70 pills. People living in rural areas and having low income are a high-risk group for opioid use disorder. The number of opioids prescribed in the US has quadrupled in the past 15 years, even though there has been no change in the amount of pain American patients report. 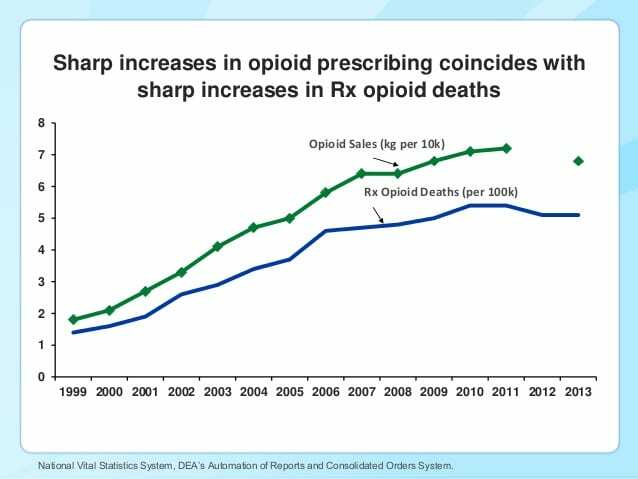 At the same time, the rate of opioid death has been growing too. There were four times as many prescription opioid related deaths in 2013 as 1999. The risk of opiate escalation is very real. People who abuse prescription opioids are forty times more likely to become addicted to heroin and 75 percent of people who used heroin in the past year misused prescription opioids first. The most common drugs involved in prescription opioid overdose deaths include methadone, oxycodone, and hydrocodone. Women are more likely than men to experience chronic pain and use prescription opioid pain medications for longer periods and in higher doses. Women make up 65 percent of total opioid prescriptions and 40 percent more women than men become persistent opioid users following surgery. The most common surgeries for women who become newly persistent opioid patients are colectomy, rotator cuff, and hysterectomy. Opioid prescription rates are substantially higher among Medicaid patients than among privately insured patients. One study revealed that 40 percent of Medicaid enrollees with opioid prescriptions had at least one indicator of potentially inappropriate use. Women make up nearly 70 percent of adults on Medicaid. People of color are far less likely to be prescribed opioids, likely due to prescriber bias. However, American Indian or Alaska Native women are at the greatest risk of dying from a prescription opioid overdose. Opioids can cause low oxygen in the blood and, especially when used in combination with alcohol or other depressants such as Xanax or Valium, they can cause breathing to stop altogether. Nearly 80 percent of those who died from an opioid-related overdose in 2016 also had another drug or alcohol in their system. Opioid use can result in physical tolerance and opioid use disorder. Although tolerance to pain relief can occur, people don’t become tolerant to adverse effects. People who take higher doses are more likely to overdose. Physical dependence can occur within weeks. Withdrawal symptoms can feel like the flu and include restlessness, muscle and bone pain, insomnia, diarrhea, vomiting, cold flashes with goose bumps, and involuntary leg movements. Acetaminophen (Tylenol) is a common and effective pain reliever. It is recommended as a first line of treatment by the American College of Rheumatology for osteoarthritis. NSAIDs include ibuprofen, aspirin, and naproxen. More potent than acetaminophen, most NSAIDs are available over-the-counter. Higher doses are available with a prescription. However, some adverse side effects include a greater risk of kidney or liver toxicity and ulcers. Cannabis is effective for chronic pain. States with legalized cannabis have a lower number of opioid prescriptions and lower average daily opioid dosage. Steroids can provide pain relief. Drawbacks include the potential to accelerate joint destruction, immune system suppression, gastrointestinal toxicity, and psychiatric effects. SSRIs are anti-depressants that are also appropriate for treating nerve, muscular and skeletal pain, and can also help people sleep. Both exercise and physical therapy are helpful for relieving chronic pain and maximizing function. Although it may demand more effort from the patient (attending sessions as well as following up at home with recommended exercises) it is an effective option for improving physical healing and relieving pain long-term.